Not to be confused with haikus, the Japanese traditional form of poetry. For other uses, see Haikou (disambiguation). 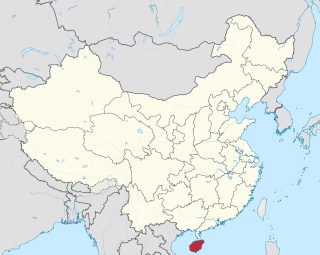 Hǎikǒu (Chinese : 海 口 ; pinyin :Hǎikǒu) is the capital and most populous city of Hainan province, China. It is situated on the northern coast of Hainan, by the mouth of the Nandu River. The northern part of the city is the district of Haidian Island, which is separated from the main part of Haikou by the Haidian River, a branch of the Nandu. 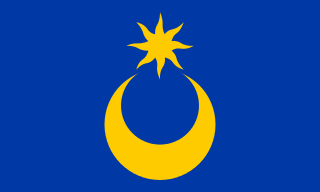 A prefectural-level municipality, prefectural-level city or prefectural city; formerly known as province-administrated city from 1949 to 1983, is an administrative division of the People's Republic of China (PRC), ranking below a province and above a county in China's administrative structure. Prefectural level cities form the second level of the administrative structure. Administrative chiefs (mayors) of prefectural level cities generally have the same rank as a division chief of a national ministry. Since the 1980s, most former prefectures have been renamed into prefectural level cities. Hainan University, commonly referred to as Haida, is a comprehensive provincial university in Haikou, Hainan province established in 1988. It is a Chinese Ministry of Education Double First Class Discipline University, with Double First Class status in certain disciplines. The hanzi characters comprising the city's name, 海口 , mean ocean/sea and mouth/port, respectively. Thus, the name "Haikou" is also a word for "seaport" - similar to Portsmouth in England. Haikou originally served as the port for Qiongshan, the ancient administrative capital of Hainan island, located some 5 km (3.1 mi) inland to the south east. During its early history Haikou was a part of Guangdong province. In the 13th century it was fortified and became a military post under the Ming dynasty (1368–1644). The port is located west of the mouth of the Nandu River, Hainan's principal river. When Qiongshan was opened to foreign trade under the Treaty of Tianjin in 1858, Haikou started to rival the old administrative city. It was known internationally as 'Hoihow', based on the local dialect. 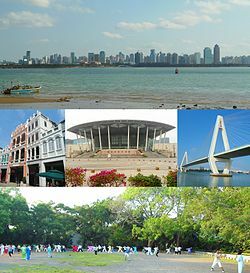 In 1926, Haikou overtook Qiongshan in population and it was declared a separate administrative city. Haikou was developed as a port during the Sino-Japanese War (1937–45) when the Japanese invaded and occupied Hainan Island from early 1939 to 1945. 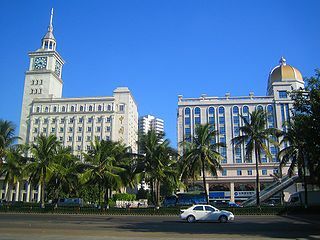 The city and island of Hainan stayed under the control of the Nationalists until April 1950, when it fell to the Communists during the Landing Operation on Hainan Island. 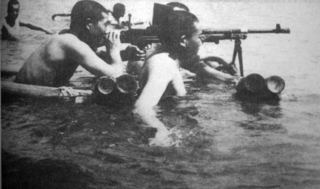 The Landing Operation on Hainan Island, also known as the Hainan Island Campaign (海南岛战役) or the Hainan Campaign (海南战役) for short, was a series of battles fought between the Kuomintang (Nationalists) and the People's Liberation Army (PLA) for the island of Hainan during the resumption of the Chinese Civil War in the post-World War II period, and resulted in a Communist victory. Since 1949, Haikou has maintained its position as Hainan's main port, handling more than half of the island's total trade. It has replaced Qiongshan as the island's administrative capital. In 1988, Haikou was made a prefecture-level city as well as the capital of the newly created Hainan Province. Haikou old town contains the oldest buildings in the city and was largely built by wealthy Chinese from the mainland and some "overseas Chinese" who had returned to their homeland. The houses are a mixture of styles including Portuguese, French, and Southeast Asian. The streets used to be divided into different areas selling Chinese and western medicine, for silk and bespoke clothes, one for fresh fish and meat, and others for the sale of incense, candles, paper, ink, and other goods. Various projects are currently under discussion to decide the best way to restore and preserve these historical buildings. Haikou is situated on the north coast of Hainan Island, by Haikou Bay, facing the Leizhou Peninsula across the Qiongzhou Strait that stretches west from Beibu Bay near Vietnam to the James Shoal bordering the South China Sea to the west. Most of the city is almost completely flat and only a few metres above sea level. It has an area of 2,304.84 km2 (889.90 sq mi). [ citation needed ]  The Meishe River winds through the east side of the city flowing northward to the Haidian River. 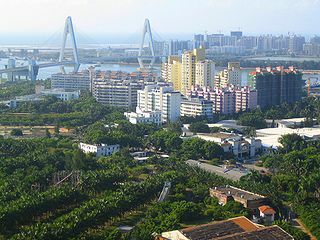 The northern part of Haikou City, the district of Haidian Island, is separated from the main part of Haikou by the Haidian River, a tributary of the Nandu River. The district is accessed by one of four bridges, the largest being Haikou Century Bridge, which connects the Guomao district with Haidian Island at the estuary of the Haidian River. From east to west the remaining three road connections are provided by the Renmin, Heping and Xinbu Bridges. Directly to the northeast of Haikou and to the east of Haidian Island is Xinbu Island. Haikou is on the northern edge of the torrid zone, and is part of the Intertropical Convergence Zone. April to October is the active period for tropical storms and typhoons, most of which occur between August and September. May to October is the rainy season with the heaviest rainfall occurring in September. 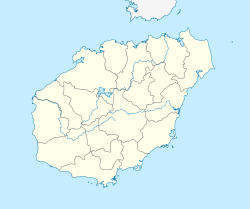 Despite its location 378 km (235 mi) south of the Tropic of Cancer, the city has a humid subtropical climate (Köppen Cwa), falling just short of a tropical climate, with strong monsoonal influences. As of 2018 [update] , Haikou has the second best air quality among major cities nationally, preceded only by Lhasa, Tibet. However, since approximately 2009, due to an increase in the number of automobiles, there has been somewhat worsening air pollution. The groundwater is of international standard [ clarification needed ], and is classified as mineral water. Haikou city has also built 163 model ecological villages. Now, over 200,000 villagers in 933 villages have tap water in their homes. Traffic: Many new street crossings with traffic lights were installed around the city to improve two-wheel vehicles (consisting mainly of electric motorbikes) and pedestrian travel. Throughout the city, teams of police have been stationed at major intersections to ensure that two-wheel vehicles obey the law. Although there are many side lanes for these bikes, the actual pedestrian sidewalks serve as legal, one-way routes. Police at intersections stop vehicles either going the wrong way, or running red lights. Offenders may be forced to wear a red sash, stop other offenders, and lecture them. Commerce: Around August 2015, teams of officers physically removed nearly all illegal structures used for business in the city (a province-wide campaign). These structures were commonly made of corrugated metal or cinderblocks and were shop extensions or simply unused space that had been built upon. Street vendors were banned (most of whom sold vegetables or fruit), as was the night operation of roadside BBQ sites and the placement of tables onto the sidewalks by restaurants. These night time food operations were once common throughout the city. Roads and sidewalks: Many small roads have been repaved including narrow lanes in old neighbourhoods. Also, many sidewalks have been upgraded with new brick. Bricks are used as sidewalk material in Haikou because of the large amount of ficus trees, the roots of which deform the surrounding sidewalk. Demolition and reconstruction: A number of entire neighbourhoods within the city have been, and are being, entirely demolished with new buildings and roads being built. Starting around the beginning of 2018, the city government funded painting and cladding of a number of buildings in the city centre. 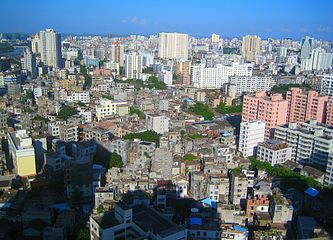 According to the 2010 Census, the prefecture-level city of Haikou has a registered population of 2,046,189 inhabitants, 537,848 more than the population declared on the past census in 2000. The average annual population growth during the period 2000–2010 was of 3.1 percent. Most of the population of Haikou are Han Chinese (around 97.75 percent, according to the 2010 Census). Haikou is divided in four districts. The information here presented uses 2010 Census data. Guomao is a relatively affluent area located on the coast between Longquan Road to the east running west for more than one kilometre. The west part of this area has experienced substantial development since about 2007, and now contains dozens of newly built high-rise residential apartment buildings. This historical area is located on the south side of the Haidian River, at the northern part of mainland Haikou. Much of the area comprises arcade style, dilapidated buildings with European fusion-type architectural facades with Indian and Arabic influences. The buildings are almost all painted white, and are usually no more than a few storeys tall. The eastern part of the area is mainly residential. The western part contains hubs for such items as exotic foods, pets, and fabrics. The building facades and roads have been restored in most of the area, Zhongshan Road being the most notable. Located on Haidian Island, this area comprises the entire portion of the island west of its main north/south road, Renmin Dadao. It appears similar to a typical student ghetto, containing many small, inexpensive food stands and restaurants. A new neighbourhood is under development in Xiuying District around seven km west of downtown Haikou. Located within the neighbourhood are Hainan International Convention And Exhibition Center and Wuyuan River Stadium. Also, a number of government offices have moved there and numerous residential apartment complexes are being built. Evergreen Park is a 71.3 hectare  park located on Binhai Road about 200 m west of the southern foot of Haikou Century Bridge. It is the largest park in Haikou, containing approximately ten thousand coconut trees and several hundred species of South Asian ornamental plants,  however, most of the park consists of grassy fields. Baishamen Park (White Sand Gate Park) was created in 2010 and is located on the north shore of Haidian Island. The park contains a small amusement park, and consists mostly of grass fields, with little tree cover. Changying Global 100 Fantasty Park is an under-construction amusement park around 12 km west of downtown Haikou. Golden Bull Mountain Ridge Park (Jinniuling Park) includes a small zoo, a lake, diverse flora, and a high percentage of forest areas, including a large bamboo forest. It is located on Haixiu Road, west of Longquan Road, the main north-south avenue in Haikou. Binhai Park is located east of Evergreen Park. There is a bougainvillea hybrid exhibition held each year. This park has a small lake and building used for community purposes in the middle. Haikou People's Park is a recently refurbished park located in the downtown area on Haixiu Road next to East Lake. The park draws large numbers of people each morning who engage in exercises, predominantly tai chi, fitness dancing, and aerobics. Hongcheng Lake (红城湖) is one of the largest water bodies in the city being around equal in size to the lake at Golden Bull Mountain Ridge Park. It has three islands, the largest of which contains a defunct hotel. The lake is a popular location for fishermen. At night, hawker stalls are set up along the roadsides for tourists and locals to drink and dine. Holiday Beach is a 7 kilometres (4.3 miles)-long beach and visitor attraction adjacent to the west side of Haikou. Dongzhai Port Nature Reserve lies some 15 kilometres (9.3 mi) south east of Haikou and was the first protected mangrove forest zone in China. The Haikou Tower is an under-construction supertall skyscraper. Located on Guoxing Avenue at Haifu Road, it will be 94-storeys, and is scheduled for completion between 2020 and 2023. Haikou exports substantial quantities of agricultural produce and livestock. [ citation needed ] There is a small amount of industry, including canning, textiles, rice hulling, and light engineering. Near the southern end of Haikou, automotive manufacturer, Haima Automobile has its global headquarters. Hainan University just inside the north gate. Hainan University has its main campus on Haikou's Haidian Island, with the South China Tropical Agricultural University, now part of the university, located in the southern part of the city. Hainan Normal University is the oldest institution for higher learning. It has an enrolment of more than 20,000, including approximately 200 foreigner students, and has recently constructed a new campus in Guilinyang, just outside Haikou. Hainan Medical College, founded in 1993, offers degrees in medicine. It is located in the southern part of the city. Qiongzhou University is located in Qiongshan District. Haikou College of Economics, located by Guoxing Avenue, with a new campus in Guilinyang. Chinese Academy of Tropical Agricultural Sciences is located across the road from Hainan Medical College. Haikou has an extensive urban bus service. Standard fare is 1 yuan, with no bus pass, ticket, or transfer system in place. Urban minibuses operated prior to 2009, but have since been phased-out. Taxi automobiles and electric motorbikes operate throughout the city. During 2009–2010, petrol-fueled motorbike taxis were banned and seized by police at numerous checkpoints within the city. Haikou has experienced a substantial increase in cars since the early 2000s. Traffic on main streets, once light, is now similar to other major cities, with rush hour problems that have prompted the city to expand several main roads and build a new elevated road from the west end of Guoxing Avenue to new developments west of Holiday Beach. Many main roads in the city have a side lane, separated by a median, for two-wheeled vehicles. Physical barriers were installed on many of the main two-way streets throughout the city in order to separate opposing lanes. These were installed for safety reasons to prevent pedestrians from crossing the streets at locations other than intersections. Roundabouts are not prevalent in Haikou, being used mainly on Hai Xiu road, and a few other locations. Traffic cameras are used at many main intersections in the city, with tickets being issued by post for traffic light infractions. There is one tunnel in the city, the Qiaozhong Road Tunnel. A Haikou Public Bicycle System station. The Haikou Public Bicycle System has about 20,000 bicycles. A pre-paid swipe card system is used to gain access to them. Starting on January 24, 2017 privately run app-based "dockless" shared bikes came into service. By April, there were about 40,000 of these types of bikes available. Ofo, Mobike, and "Quick to" all cost 2 RMB per hour. Ofo and "Quick to" bikes have tires with tubes, meaning many are left around the city with flat tires. The Haikou Public Bicycle System has installed a number of new, more modern bikes with tires that cannot be punctured. Part of Mobike's fleet also uses these types of tires. Haikou is served by Haikou Meilan International Airport (IATA: HAK, ICAO: ZJHK), which is located 25 km (16 mi) from the city. A railway links Haikou to the mainland. A ferry service transports the railway cars, along with other motor vehicles across the strait. The Hainan East Ring Railway links Haikou and Sanya. There are 15 stations in between, either in operation or still under construction. Trains are designed to travel at 250 km/h (155 mph). Travel time from Haikou to Sanya is approximately 1 hour and 22 minutes. 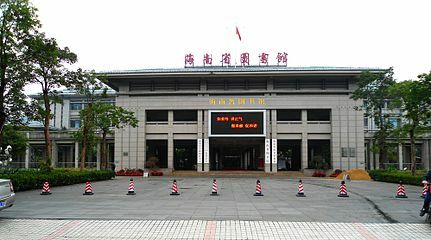 The main station in Haikou is Haikou East railway station located near the southern end of Long Quan Road. In 2018, the Haikou South Station, the main bus station, relocated and is now directly to the south east of the Haikou East Railway Station. In 2015, the Hainan western ring high-speed railway started operation. This second high-speed railway runs along the west coast of Hainan connecting with the Hainan Eastern Ring Railway. Three main highways connect Haikou to other parts of Hainan, running east, west, and south through the middle of the province. The Haiwen expressway connects the city with Wenchang to the southeast. The main bus station is Haikou Transportation Center, located beside Haikou East railway station. Haikou has four seaports for passenger and cargo service. Haikou New Port, formerly known as the Inner Harbour, is located on the southern side of the mouth of the Haidian River. Approximately 7 km (4 mi) west of Haikou New Port is Haikou Xiuying Port. This port is considerably larger, and is the main distribution centre for cargo entering Hainan. It is also a major port for immigration onto Hainan Island. Around 20 km (12 mi) west of downtown Haikou are South Port and Haikou Port New Seaport. Several large public buildings now occupy Guoxing Avenue, the new area for arts and culture. These include the Hainan Provincial Museum, the Hainan Provincial Library, and the Hainan Centre for the Performing Arts. These are all located near to one another on the south side of the road, west of Haikou College of Economics, Haikou campus. At the west side of Evergreen Park is the Haikou Great Hall of the People, a concert hall, and Hainan Exhibition & Convention Center, a large centre for trade shows and other commercial events. Haikou City Stadium, is the main venue for sports events, and is located at the southeast corner of Evergreen Park. The Wuyuan River Stadium opened in April 2018. It is located west of downtown Haikou, near the newly built Haikou West Coast. With a capacity of over 40,000, it is the largest stadium in the province. Older cultural sites include the now-restored buildings of the Bo'ai Road area, the tomb of Hai Rui, Xiuying Fort in the Guomao area, the Temple of the Five Lords, the cemetery for the martyrs of Hainan's Battle of the Liberation, and the former temple Haikou Yazhou Gu Cheng. Bars and KTV are patronized until after midnight. There are several popular bar streets within the city. Up until 2015, roadside BBQ sites were common throughout the city. A large-scale campaign to clean up the city has since prohibited them. Haikou is also developing its Meetings, Incentives, Conferencing, Exhibitions industry. 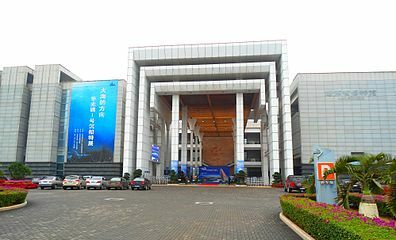 The local government set up the Haikou Convention and Exhibition Bureau in June 2012 and pledged RMB35 million (US$5.6 million) to support the development of the MICE industry. More international hotel chains are also arriving. By 2013, international brands included Shangri-La, Westin (opening September 2013  ), and Sheraton. Haikou Century Bridge is a cable-stayed bridge in Haikou city, the capital of Hainan province. Haidian Island is an island that forms part of the city of Haikou, Hainan Province, China. It is separated from the main part of Haikou by the Haidian River. The north coast faces the Qiongzhou Strait. The east coast faces Xinbu Island, separated by part of the Nandu River. The west coast faces Haikou Bay. Haikou New Port is a seaport in Hainan, China. Formerly known as the Inner Harbour, this port is located on the southern side of the mouth of the Nandu River 7 km east of Haikou Xiuying Port. Prior to around 2016, it was main distribution centre for cargo entering Hainan, including seafood, with a wholesale fish market located at the far eastern end. The wholesale fish market is now located in the middle of Xinbu Island. Haikou New Port was also a major port for immigration onto Hainan Island. Xinbu Island (新埠岛) is a coastal island located directly to the east of Haidian Island in Haikou, Hainan, China. This island, located at the mouth of the Nandu River, has a population of approximately 4,000 people. Xinbu Island effectively splits the Nandu River as it flows north to the sea. The main part of the river flows along the east coast of the island while the Huanggou Channel, a distributary, flows along the west coast. Haikou University of Economics, formerly known as the Haikou College of Economics and Vocational Technology, is an educational institution located in Hainan Province, China. Evergreen Park (万绿园) is a public park located in Longhua District, Haikou, Hainan Province, China. It is the largest park in the city. The Haidian River runs through Haikou City, separating the main part of and its northern part Haidian Island, in Hainan province. Its tributary is the Nandu River. Haikou Bay is a bay on the northern coast of Hainan Province, China, in the Qiongzhou Strait. It is named for Haikou City, which is situated on the coast. The Haikou City People's Hospital (海口市人民医院) is located on Renmin Avenue, Haidian Island, Haikou City, Hainan Province, China. The HNA Building, also known as the New Haihang Building or Xin Haihang Dasha, is the headquarters for Hainan Airlines and the HNA Group. It is located at the west end of Guoxing Avenue on the north side of the road, in Haikou, Hainan, China. Haikou New East Bridge is an arch bridge over the Nandu River, Hainan, China. It connects Xinbu Island at the west to Dongying town and the rest of the province at the east. Haikou Tower, or Haikou Tower 1, is an under-construction supertall skyscraper on Guoxing Avenue, Haikou, Hainan, China. It will be the tallest in a suite of ten buildings on a site called Haikou Towers or Hainan International Exchange Square. Haiwen Bridge is a cable-stayed bridge located east of Haikou City, Hainan, China. It crosses the mouth of Dongzhai Harbor and was built to provide quicker access between Haikou and Wenchang, a large, administrative division of Hainan province. The bridge reduced travel time from Haikou to Wenchang City from 90 minutes down to around 20 minutes. Century Park (世纪公园) is an 8.40-hectare, public park located downtown Haikou, in the Longhua district of the city, Hainan Province, China. It is located northwest of Binhai Park and east of Evergreen Park. The Haikou Century Bridge travels over part of it. Guoxing Avenue is a major street in Haikou, Hainan, China. It runs in an east-west direction in the heart of the city. Its west end terminates at Longkun Road and its east end terminates at the Qiongzhou Bridge which crosses the Nandu River. East Lake Triangle Pool, commonly known as East Lake, is a set of two small lakes in the East Lake area of Haikou, Hainan, China. It is located at the south-west corner of the Bo'ai Road area and at the north side of People's Park. The Meishe River is a river within Haikou City, Hainan, China. Its source is the spillway at the east end of the Shapo Reservoir located just south of the city. The Meishe flows eastward under Longkun Road south of the Haikou East Railway Station. It then turns north, past the Meishe River National Wetland Park and winds northward through the east side of urban Haikou, under Guoxing Avenue, finally emptying into the Haidian River just east of Heping Bridge. 1 2 海口市2010第六次人口普查主要数据公报. Haikou People's Government (in Chinese). Haikou Municipal Bureau of Statistics. 11 May 2011. Retrieved 23 July 2015. ↑ "Geography of Haikou" (in Chinese). Official website of Haikou government. 2008-04-01. Retrieved 2008-06-11. ↑ 中国地面国际交换站气候标准值月值数据集（1971－2000年） (in Chinese). China Meteorological Administration. Archived from the original on 2013-10-16. Retrieved 2010-05-04. ↑ "Extreme Temperatures Around the World" . Retrieved 2013-02-21. ↑ Hong, Lin; Thai, Michael. "Fuzhou ranks third in air quality across the nation". chinadaily.com.cn. ChinaDaily. Retrieved 2014-06-18. ↑ "Ambient Air Quality in Main Cities (2004) in China Statistics 2005" . Retrieved 2010-06-27. ↑ "Haikou's Healthy New Environment". China.org.cn. 2004-08-27. Retrieved 2010-10-18. ↑ -- 海南省人民政府网. www.hainan.gov.cn (in Chinese). ↑ 冉苗俊. 为海口“双创”从啃硬骨头下手点赞__海南新闻网_南海网. www.hinews.cn (in Chinese). ↑ 海口威立雅水务. Haikouvw.com. Retrieved 2011-12-27. ↑ "Veolia's big bid for Haikou Water | Global Water Intelligence – Archive: Global Water Intelligence". Globalwaterintel.com. Retrieved 2011-12-27. ↑ "Haikou City No. 1 Water Affairs Company Limited – Individual Project Information – Private Infrastructure Projects – The World Bank & PPIAF". Ppi.worldbank.org. Retrieved 2011-12-27. ↑ 威立雅水務(海口)投資有限公司注册信息|Veolia Water (Haikou) Investment Co. Limited registered information (in Chinese). Hkcopinfo.com. Archived from the original on 2012-04-26. Retrieved 2011-12-27. ↑ "Qilou Arcade Streets in Haikou, China's Hainan". Usa.chinadaily.com.cn. Retrieved 2013-04-26. 1 2 "Evergreen Park | Haikou Living ~ 'drs2biz'". Drs2biz.wordpress.com. 2010-06-15. Retrieved 2011-12-27. ↑ "Haikou Parks". Archived from the original on 2014-02-20. Retrieved 2011-02-09. ↑ Zhao, Zhang. "Haikou promotes projects for international fair". chinadaily.com.cn. ChinaDaily. Retrieved 2014-06-18. ↑ "Contact Us Archived 2010-07-23 at the Wayback Machine ." Hainan Airlines. Retrieved on October 3, 2009. ↑ "Haikou Free Trade Zone". hktdc.com. Retrieved 2012-06-20. ↑ "Hainan to record unruly shared bike usage in personal credit system". www.ecns.cn. ↑ "China Loosens the Screws on a Toehold of Its Airspace". ↑ "Haikou travel guide". www.travelchinaguide.com. Travel China Guide. Retrieved 20 December 2016. ↑ "More Scenic Sites to Be Built in South China Province". China.org.cn. 2003-03-22. Retrieved 2010-10-18. ↑ "Surf's up for Hainan island". TTGmice. Retrieved 15 April 2013. ↑ "THE WESTIN HAIKOU – OPENING SEPTEMBER 28, 2013". Westin. Retrieved 15 April 2013. 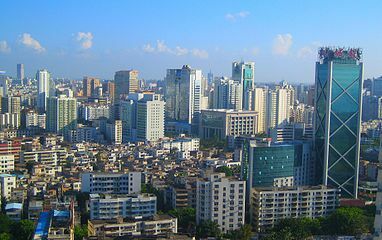 Wikimedia Commons has media related to Haikou . Wikivoyage has a travel guide for Haikou . a Direct-controlled Municipalities. b Sub-provincial cities as provincial capitals. c Separate state-planning cities. 1 Special Economic Zone Cities. 2 Coastal development cities.